In this solo cooking adventure, Gary adapts a traditional Singapore chicken dish to one more to his liking. 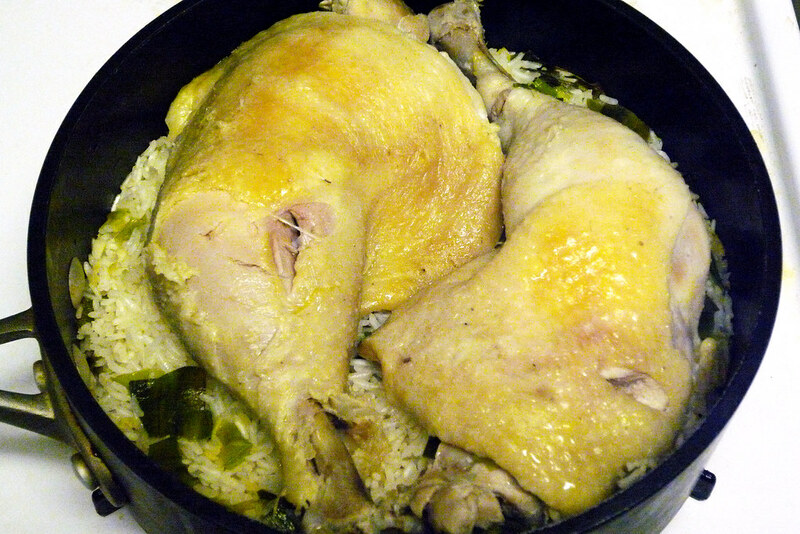 I don’t remember the first time I had Hainanese Chicken Rice but I know I’ve always loved it. After all, we’re talking about nicely cooked chicken atop rice that’s been cooked with the water the chicken once took a hot bath in. It may seem weird to eat boiled chicken, considering most Americans eat their chicken roasted or fried but we’re not talking about making a soup here – no boiling the chicken to within an inch of its life! Okay, we’re actually boiling the chicken but rather poaching it so it’s not so weird. Also, there is a sort of soup that will result from poaching the chicken but we’ll just be using it for flavoring the rice. So I’ve come up with this recipe after some research online. It’s mostly authentic save for my usage of leeks instead of scallions. That’s more due to the fact that I had leeks lying around from a CSA share and I wanted to use them sooner than later. The big change I made was the chicken itself. Eschewing a whole chicken, I went with two whole chicken legs. Let’s face it, most people (myself most definitely included) prefer the moist dark meat of the legs and this makes it easier when it comes to serving sizes – one leg per person! The cooking of this dish can essentially divided into two parts. 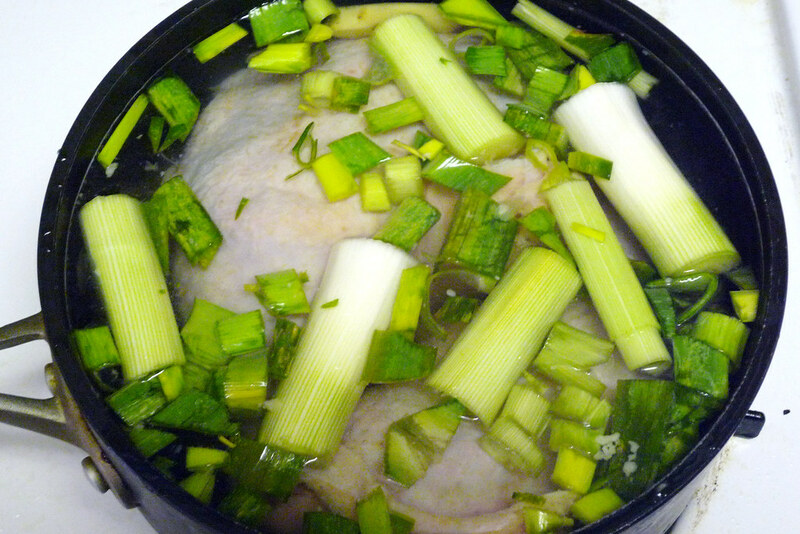 The first is cooking the chicken in water that’s filled with ginger, scallions (leeks, in my case), and some sesame oil. When the chicken’s done cooking, it’s fished out, and we’re left with a delicious chicken broth. The second part is, of course, the rice. It’s quickly heated up with the same aromatics and then the reserved chicken broth is added in place of water. Once the broth is fully absorbed by the rice, it’s time to serve. I actually made a quick sauce from the chicken broth, adding it to equal parts soy sauce. Plate the chicken and rice, drizzle the sauce, a few drops of sesame oil, and dig in. Chicken: Season the chicken by rubbing kosher salt all over it. Place the chicken legs into a pot and fill with enough cold water to cover by 1 inch. Add the ginger, scallions, sesame oil, and white pepper to the water. Bring the water to a boil and then lower the heat to a simmer. Cook until the chicken legs are fully cooked (approximately 20-25 minutes). Remove the chicken from the pot and let cool. Strain the broth, making sure that the scallions and ginger are removed from it, then set aside for the rice. 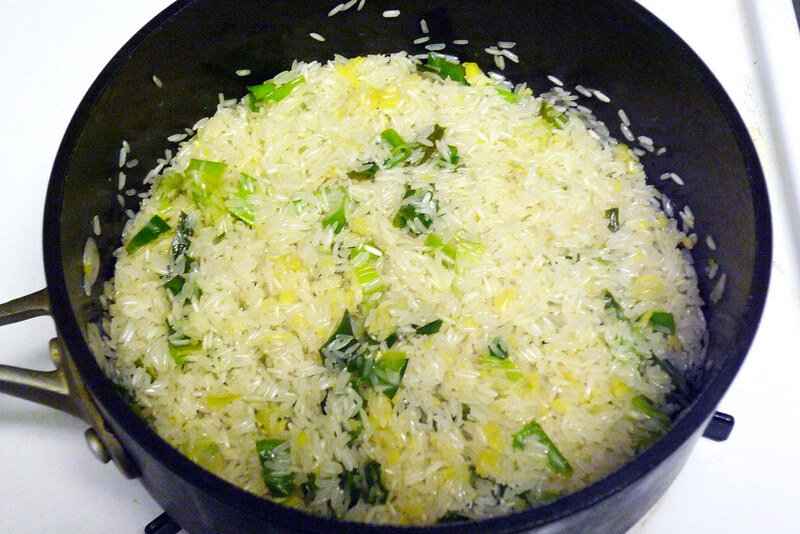 Rice: Heat the canola oil in a pot over medium-high heat until hot. Add the ginger and garlic to the pot until fragrant. Add in the rice, stir for a few minutes to coat, then add the sesame oil. Add the chicken broth, salt, stir to mix thoroughly, and bring to a boil. Turn the heat down to simmer, cover the pot and cook for 15 minutes. Remove from heat and let sit for 5-10 minutes more with the lid still on. Plate the rice and the chicken. 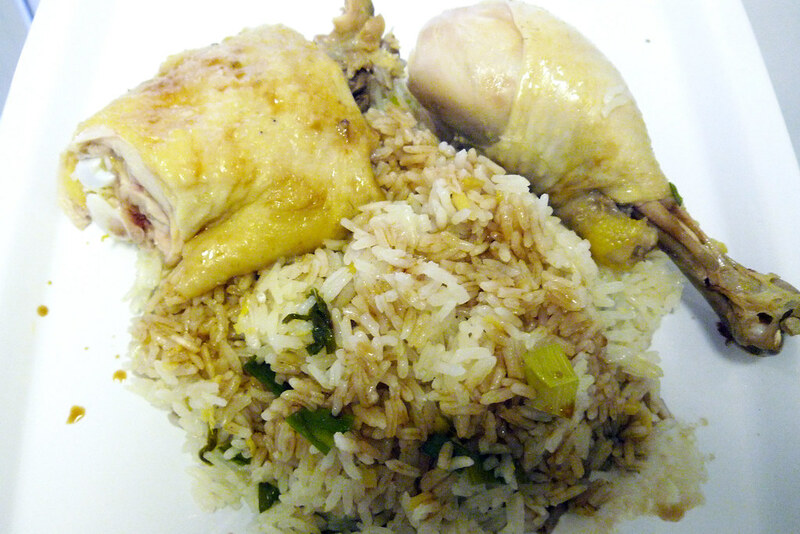 Optionally, drizzle some sauce on the chicken and rice as described above (1 tbsp chicken broth + 1 tbsp soy sauce). Finally, add a few drops of sesame oil onto the chicken.